I am currently loving the trend towards organic and handmade when it comes to children’s toys. After so many years of plastic toy love, I think that we can all agree that there is a need for real down to earth products that don’t inundate our children with the image of the Barbie. I am always amazed by the incredible craftsmanship that goes into handmade dolls, and the businesses that these incredible women start from the ground up. These are a few of my favourite handmade dolls from around the world. It goes without saying that these dolls are incredibly stylish and well made. Native Californian Jess has taken her love of making dolls for her daughter and turned it into a doll empire that has not lost its integrity. 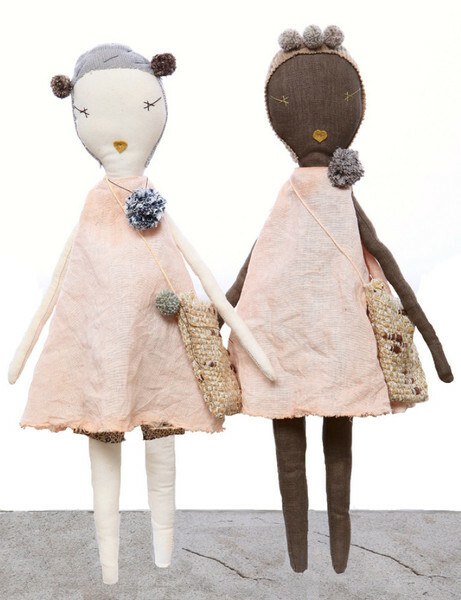 Each doll is lovingly hand made using tea dyed muslin and vintage fabrics. Her dolls have even grabbed the attention of some incredible fashion designers who have worked with her on collaborations to put their clothing on her dolls. This list includes Ryan Roche, Wovenplay for Adventure and Atsuyo et Akiko just to name a few. 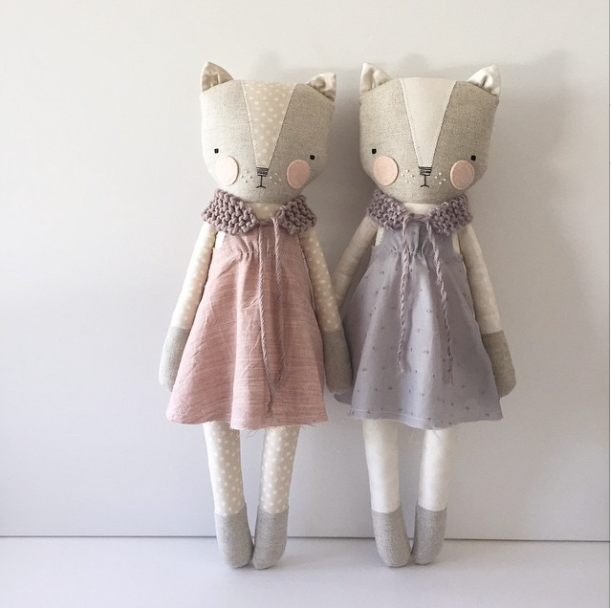 Jess Brown dolls can be found on the designers website, as well as many children’s boutiques such as Fawn Shoppe and Minikin. The formidable Jenni from Cloth and Thread began her doll making business in 2011 with her classic elephant Elodie, who has since been joined by a few different creatures from the animal kingdom. Her dolls are stunningly beautiful with perfect rosy cheeks and expressive eyes. They are clothed in incredibly detailed outfits made out of tulle and silk which are often dip dyed to reach the desired colour. Her dolls have been selling out within a matter of minutes when she lists new releases online, which I think only adds to the allure. 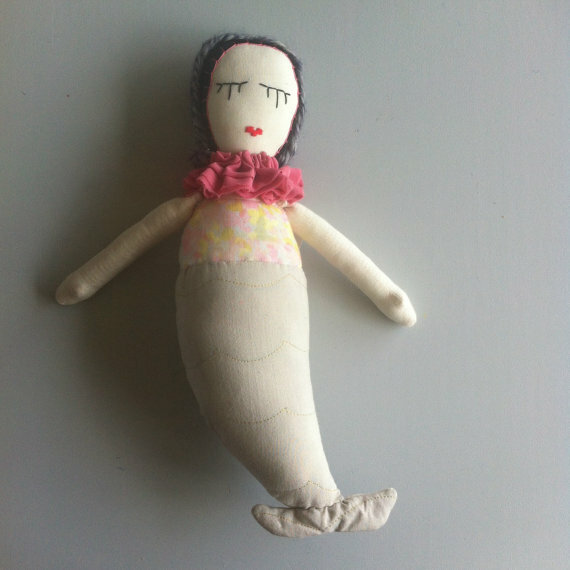 Cloth and Thread dolls can be found on Jenni’s website, as well as a few (very lucky!) wholesalers. Check out her Instagram to keep in the loop regarding new releases. I stumbled upon Katia’s work on Instagram one day and have been captivated ever since. 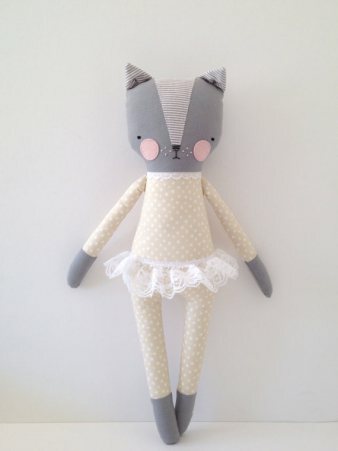 She makes the most gorgeous kitty dolls in both female and male versions (which I love!) If you follow her in Instagram you can see that she has an owl prototype that she has been working on but has not released to the public yet. She has just started to make beautiful dresses, shawls and sweaters for her dolls, which is a fun way to keep adding to your little collection. Each piece is hand made and absolutely incredible quality. I think that we can expect incredible things from this lady in the future. Lucky Juju dolls can be found on Katia’s Etsy page. They are often sold out however, so your best bet is to follow her on Instagram for shop updates. Sophia started Studio Escargot as a way to combine her love for fashion and children’s toys in a business that was all her own. She started Studio Escargot out of her Amsterdam home studio, and the business has grown from there. Her dolls are gorgeously whimsical and detailed and are a bit smaller in size than some of the other dolls mentioned here. Sophia is kind enough to also offer a custom design service where you can work with her to design the doll of your dreams. 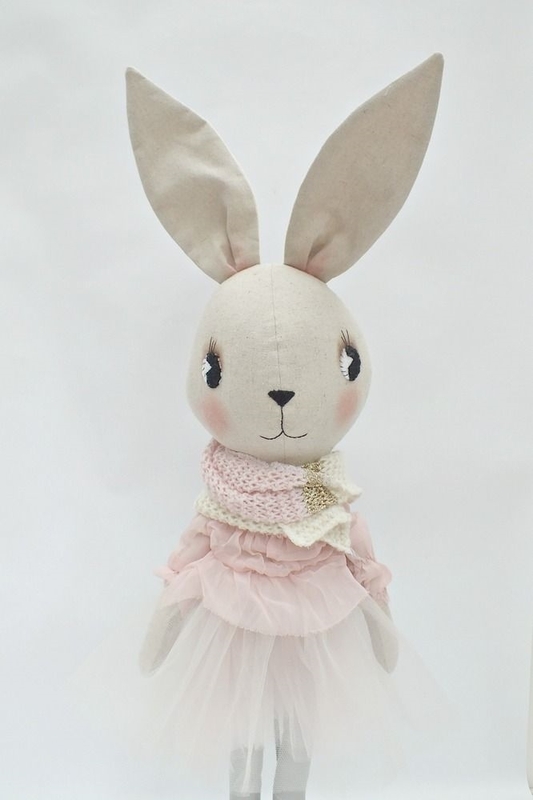 You can find Sophia’s dolls in a few retailers such as Cissy Wears in the UK or in her popular Etsy shop.